Some of the tools described here are still in use – at least in education at school. However, most of the items have disappeared from a professional environment. Even the drawing board has disappeared. But we all are still dreaming of screens of that size! See also links and my private collection. Ellipse compass der ellipsenzirkel ??? Circle drawing tool der kreiszeichner ??? Early drawing pens were made similar to forceps, with a screw to adjust the distance of the two legs which held the indian ink. I remember the time when the two legs even had to be smoothed with a honing stone to undo the waering from the very harsh paper. For my map drawing I also had a double pen (for streets) and a free wheeling pen for altitude curves (isohypses). The pen at this drawing fountain pen could easily be exchanged for writing with types for narrow and wide lines. The most common drawing board for engineers and also for illustrators used a parallelograms to keep the rulers parallel to itself. 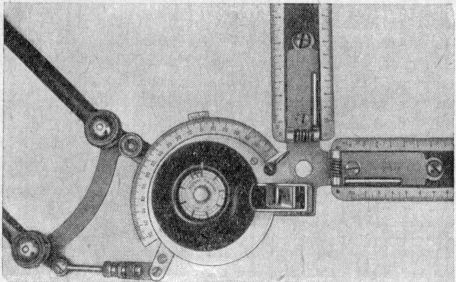 The detail picture shows the 'head' of the machine: The rulers could be exchanged according to the desired scale; they could also be rotated in 15 degree steps or fixed at an arbitrary angle. For wide drawing boards (especially used in the ship industy) the parallelogram mechanism was replaced by a horizontal rail on top with a 't-square' on roller barings holding the drawing head. 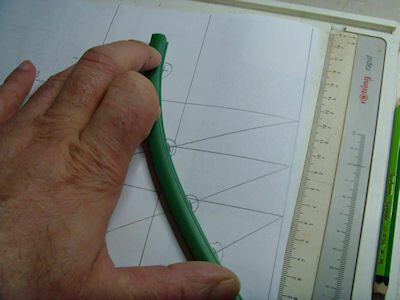 Amateurs and students most time are confined to simple forms of a drawing board with a t-square to draw horizontal lines (the board was not square enough to allow for verticals also). Angles in steps of 15 degrees require 2 set squares with 90-45-45 degrees and 90-60-30 degrees. Arbitrary angles are supported by adjustable set squares. For the desktop A2 and A3 sized drawing tablets became available with a combination of t-square and protractor. I still have an A3 sized in use. For working on the desk a ruler is still a handy tool. Most time it is combined with a 1:1 scale with tic marks at every mm. For typographic purpose also rulers with pica, points etc. are still in use. Convenient tools on the desk are parallel moving rulers. One type has (rubber coated) rollers to guide the movement. 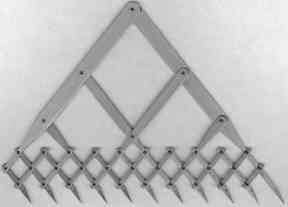 Another type connects two parallel half-rulers with two legs forming a parallelogram with the ruler.The type with the rollers often is combined with a mechanism to slip the ruler step be step for hatsching. A more elaborate example is pictured hereafter. This is a multipurpose tool especially for students. Even math formulas and trigonometric tables are available. With the various holes on the long edge a compass can be simulated. 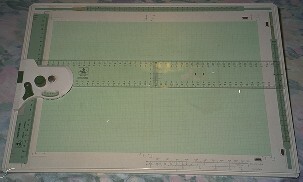 Since various drawing scales were needed, the tool combined 6 scales, for example, 1:200, 1:50 etc. (metric engineer's scale) or 1:48, 1:128 etc. (imperial). Also very strange scales for rural maps could be found: 1:1440 and 1:2880 (architect's scale). Not only children like templates. Making illustrations on paper very often is faster than any computer based method... A standard catalogue for templates as of 1997 lists hexagons, ellipses, electrical and chemical signs etc. 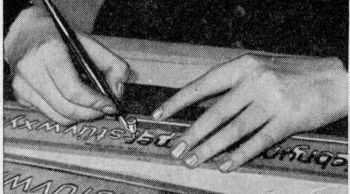 For special purpose lettering stencils are still used. A common set of curves is the Burmester set displayed here. The first item is very handy for ellipses, the second very often fitts large parts of hyperbolas and the third (largest) item is used most for parabolas. During my time as a mechanical engineer I also used a very special courving tool: some sort of plastic snake with lead spine, about 40 cm long. This could be bent to the desired shape. In ship building where drawings frequently were to the scale (or at least as large as rooms), another form of curving tools were in use. This is a long straight slat of wood or other bendable material. It was pinned down along few points shaping the curve. To adjust to arbitrary curved shapes a flexible rule (plastic with lead spine) is used. This has no inner tension, so control points did not work properly. Sometimes it was called lesbian rule. Various types of compasses and drawing pens were combined in a box of drawing instruments. 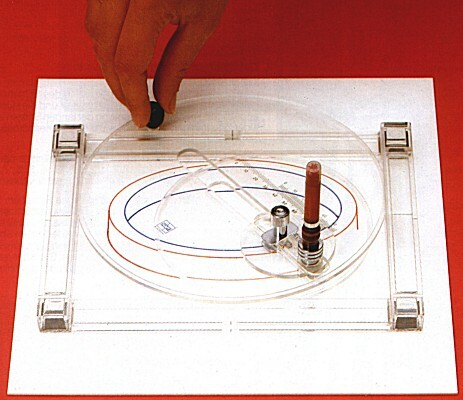 The compass in this set could draw circles up to 25 cm in diameter by means of an elongation rod. To draw very small circles a drop compass and a bowcompass is included, sometimes also a divider compass with two pins. The left picture is the set from my father (about 1930), the right is from the catalogue of Linex, DK (2015). For larger circles the needle and pencil are arranged on sliders on a rod or beam, which might also be eleongated. I remember that once we needed a radius of 4m. Kneeling on the floor we just used an ordinary wooden rod of that length. There are however also special instruments to draw large circles. 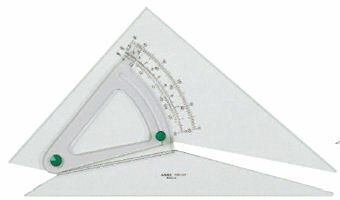 Proportional compasses are used to divide distances or to 'convert' them according to a scale. A specialized device for the relation of the golden rectangle may be still in use by sculpturers and other artists. The rightmost image depicts an instrument to divide a distance into up to 10 equal parts. But how to draw circles, if the center can not be reached? I have only a scetch of such an instrument. There were other types available with greater accuracy, but more elaborate. b = r - sqrt(r2 - a2) For a given radius angle alpha is constant. Because a is an instrument constant, there were tables to get b from the desired radius. A simple form of this instrument consists only of two streight strips of wood fixed together in the position 1 and sliding at pins A and B on the board. H. Seyfert patented 1880 an instrument which uses a steel-blade (c-c). It is supported at both ends (m). 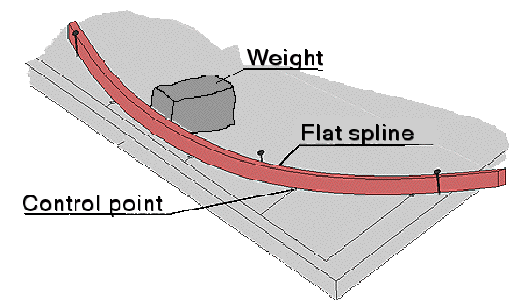 The arc is created by pushing the steel blade at the position k, while pulling the supports at m. The bending of the steel-blade is perfomed by moving the pin e down. The various levers swing around the index pins x. This is done by turning a disk which has a spiral notch engagend with the pin e. This disk is marked with the radius of the created arc. The graduation starts with 5000 mm and goes (for one turn) to 300 mm. 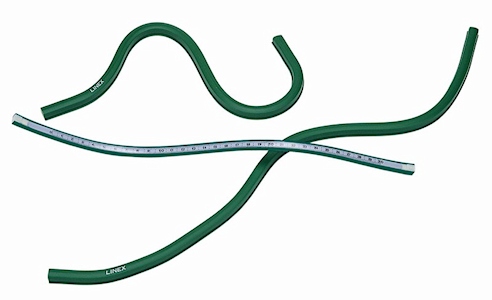 With a second turn a radius of 150 mm can be reached. Before you just could drag your mouse to get an ellipsis of any size both templates and special mechanical devices were used. The two devices depicted use different methods of drawing an ellipse. For enlarging and reducing drawings this tool was at least in use by amateurs. Heavy duty models are still in use for engraving and contour milling. Another form of this tool was called Storchenschnabel in German. 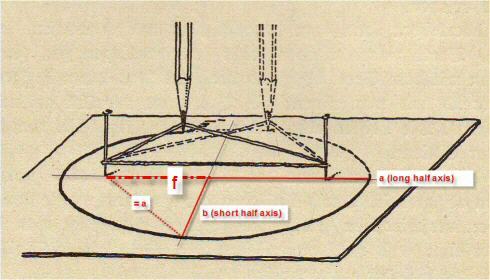 To draw correctly with perspective using vanishing points wide drawing boards with special rods were used. Let's see, maybe I find a photograph from such a device. Skilled users could combine photographs with drawn illustrations - a task nearly everybody can perform now with graphic software. You might know the camera obscura, which works only for very luminous situations. 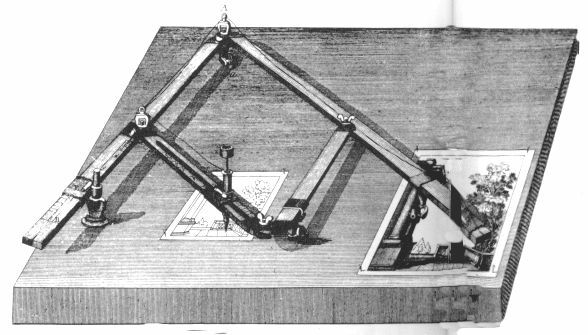 Camera lucida (light chamber) was developed by W. H. Wollaston in 1807 to draw landscapes etc. with ease. See also about.com. The main component is a 4-sided glass prism. From the oject G the light is seen by the eye A in Z, where the pencil can be used to draw the object. When the instrument is built with mirrors rather than a prism it is called mirror lucida. The following is a 'folded away' instrument from the 18th century in the catalogue of gemmary.com. Some microscope manufacturers also provide "camera lucida mirrors" or "camera lucida prisms" for drawing (rather than photographing) the seen image. For example, Cosmo Laboratory Equipment, Kay Kay Global Suppliers or Kshitij Innovation. Various forms are still in use at school. The most used one provides 180°. I still have one with 400g for the full circle (and I also have trigonometric tables for these 'neugrad' or 'new gradation' which allows more easy mathematical handling of arcs). Still available are protractors with 400g (gon) to the full circle. The divison of a right angle into 100 gon, ... allowed more easy calculations in trigonometric tables (decimal system). For military use 'artillery' versions with 6400 units for the full circle were available (at least in Switzerland). This is not a drawing tool per se, but was used by educated people for calculations. The analogue calculator is based on the logarithms, discovered (or developed) by Leibnitz, Newton and Napir 1). This principle reduces multiplication and division to addition and substraction. Potenzation and roots are reduced to multiplication and division. But also special scales for trigonometric calculations etc. were in use. 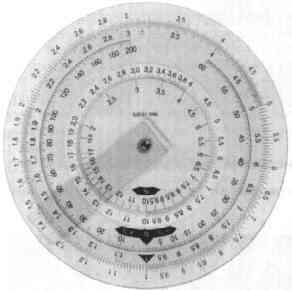 The typical slide rule of an engineer had 25 scales and was 25cm long. this allowed an accuracy of 3 - 4 digits. The sliding window shows the square of 4 (scale D) to be 16 (scale A). The tong shows the multiplication of 1.26 by 3.17 (C) = 4 (D). 'Winding up' the scales on circles allows a high precision even with a small device. Specialised versions of calculation disks are still in use, for example, to calculate settings of machines. Denis Diderot: Encyclopédie, ou Dictionnaire des sciences, des arts et des métiers; Paris, 1762 - 1777 (I have only a facsimile of the image tables). Katalog 894 (August 1994) Racher & Co AG, Zürich. Meyer zur Capellen, Walter, Mathematische Instrumente. Leipzig: Akademische Verlagsgesellschaft Geest & Portig K.-G, 1947. Origin of Shadows by Ross Woodrow, University of Newcastle, Australia. Spezialisierung und Generalisierung in der Entwicklung der Zirkel (wenn nicht mehr	dort: hier).